Okay has anybody ever used paypal and realized that they payed for the item the wrong way and wanted to switch how they bought the item? When you change the payment method do you need the other parties consent or does it work automatically. I need the answer asap otherwise my bank account will go in the neg. Edit: Is this pokemon related because I did use noppin to buy a pokemon? Mods if this is inappropriate I will take it down, I just really need the advice because I never used paypal or any of these sites before and I don't mean to be a pain. Greetings everyone I've been on the search for this Pikachu plush forever I'm in love with Pikachu because he's so different from the other Pikachus and I would love to have him do maybe somebody here can help me out so if anybody has him for sell or trade please let me know. angry Pikachu UFO plush MY GRAIL!!! Hello everyone! Greetings from the sandbox! I haven't been updating much since I've been deployed, but I am happy to announce that the first set of charms I ordered arrived, safe and sound! Unfortunately, there was no golden ticket, but that's fine, as I now have a chain of the Blaziken line and Skarmory decorating my desk space, along with the Torchic canvas that CorinthiansRose (thankfully) sent out before she rage-quit. I look forward to getting the next half of my order of the Samurott line, Durant, and Reshiram! I can't wait to get my first piece of ant merch, along with the MPC! ^^ Though it is my hope that they make him a pokedoll, or barring that, snapping up a slot with Usako-chan! I'm also looking forward to getting the fluffy-chested Cobalion to be my cuddle buddy at night! So that begs the question: What ONE piece of merch would you absolutely froth at the mouth for if it was made officially? A re-release of some rare, obscure plush? A life sized Tyranitar? Go nuts! I received a package today of the Japanese Pokemon VS series. Being that its extremely hard to find I don't know whether to save it, or open it....Thoughts? Hot Topic has exclusive Pokemon merchandise, and some are online exclusive so I though maybe we could do a group buy? HT doesn't ship internationally, but I do! 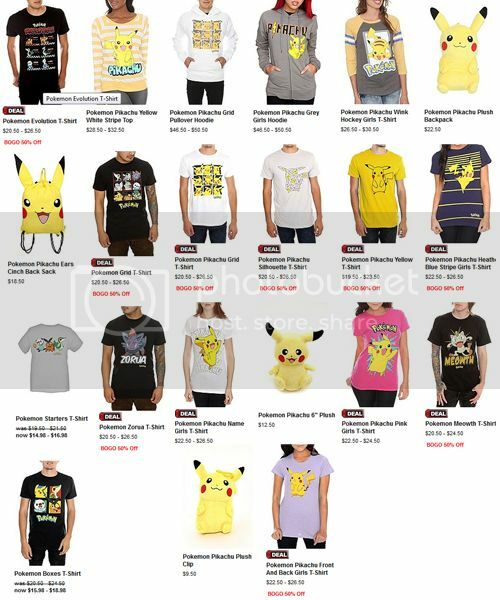 :) They are having a BOGO 1/2 OFF sale on some of their t-shirts, and any other Pokemon t-shirts are on clearance. BOGO 1/2 OFF is marked for each item it applies to. It only applies to t-shirts not on clearance, and not on any long sleeved shirts or hoodies. Who gets the BOGO 1/2 OFF discount? Everyone who orders an eligible t-shirt! We will split the discount so that means everyone who orders a BOGO t-shirt gets 25% off. That means if there is an odd number of shirts I will buy another shirt to make it even. You have until 5:00 PM CST on Friday to place your order. Sorry! I have to bump this up to 12 PM CST on Friday due to schedule conflicts! There will be only 1 payment, and I will post the spreadsheet for payments on Saturday. It's been a while since I did an update, but I got a few things yesterday that I bought from someone at my university. So some cool things.. and also some things I am hoping can be identified as I don't know what they're from! Collection Update - Lots of Great Gets! So without any further delay, let's see what's new this time around! I'm thinking about finally buying my first Pokedoll on the comm [I have looked on eBay, but I trust buying from you guys a lot more! ], but I'm not sure which one I should get. I like a lot of different Pokemon, but I want my first to be a special Pokemon or at least one that means something to me. [Unfortunately, they never made Swablu or any of the Lake Trio into Pokedolls yet... ;_;] Anyone have any recommendations for a Pokedoll newbie... and what was your first Pokedoll? Lastly.... Sales post, I choose you! So yeah! 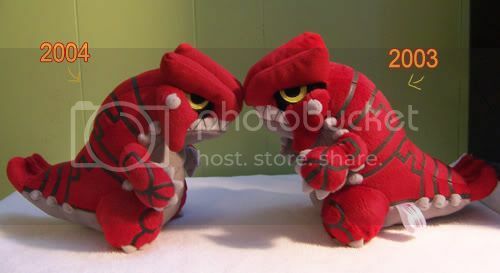 Looking for any info about these guys, i read one year was released as a new years giveaway at the pokemon center? Have I got quite the Mewtwo-infested TCG quicksale for you guys! Mewtwo EX, Mewtwo EX jumbo card, special TCGO code, and Battle City promo. how could you create a fun, fast, and awesome party outfit for a turtwig dx pokedoll? Quick Pichu Wants & Now Sales! I will be leaving for Sacramento tomorrow morning so I won't be responding to messages until I come home on Sunday! Edit: Just kidding. It turns out that the hotel had free wi-fi for once. Glittering Hoard GA ending soon! We will not win the golden cards as it currently stands, or the mini playsets. Many other things have no starting bids either, so get in there folks! Anything bought today will be shipped either tomorrow or the next day! tsuki_no_eifie!! Thank you so much! You did a great job picking for me. Thank you to the mods who planned this and to everyone in the community who made this a success! :) This was a lot of fun! New Groundbreakers + new camera = ?? Here's my first collection update of 2012! Woo! I've added four new Groundbreakers to the roster and a nice new camera to take pictures of them with! Unrelatedly, while I'm here, I'm still looking for some charms, or people to trade charms with when wave three is in! I dunno what I am going to do with my hordes of charms yet... Right now I'm hanging them off my plush net in chains, which is fun but kinda pointless! I want to wear them and show my nerd pride! I tried making a charm bracelet but it turned out too bulky for my tastes. :C Back to square one! any pickups for new pokemon pose figures? Just wondering if anyone is planning on doing pickups or orders on the new set of Pokemon Pose figures? I didn't realize that they've already been out for a week! Again, miss10 thanks a lot!! you are amazing! !